Proper nutrition is a key component of a long and healthy life for your pet. There are many brands and styles of pet food available on the market today. 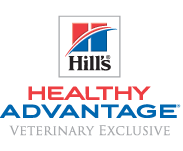 Here at Wind River Veterinary Services, we highly recommend Hill’s Science Diet & Prescription Diet pet foods that are proven safe and effective. All of Hill’s pet foods undergo feeding tests to confirm complete and balanced nutrition for your pet. Hill’s pet foods are made in their own U.S. facilities with ingredients from North American, Europe, Australia, and New Zealand which exceed industry standards for purity and nutrient content. With over 150 veterinarians, Ph.D. nutritionists and food scientists involved in the developing of their food, you can rest assured that each of Hill’s Prescription Diet products are nutritionally formulated to effectively manage its prescribed condition. 0% of what they don’t.